The climbing season 2016 started pretty well (as I wrote in another blog). Since we got "hungry" to climb more and even though of going on a climbing trip this spring. Alexandra made a couple of climbing trip proposals mainly located in southern Europe because of the Mediterranean weather. It took a while to decide who wanted to go and where we were heading. After a while we agreed to go to Siurana combined with a short trip to Margalef. We (Josh, Desiree, Alexandra and I) left Switzerland on Friday 28th of April. We had a relaxing flight to Barcelona and then a 2-hour drive to Siurana. We arrived at 2 a.m. I was pretty tired after finishing a hard working week. We started the day with exploring Siurana and having more than just one coffee. At the beginning of the afternoon, the rain stopped and we decided to check out some climbing crags in Siurana. 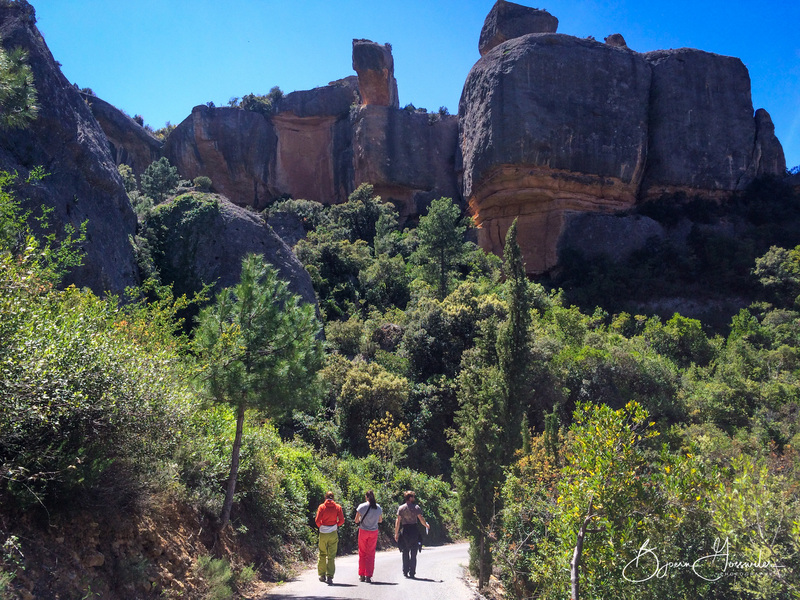 Wow, while driving through the valley of Siurana we saw a lot of different rocks, from sandstone to steep overhanging limestone rocks exposed to all directions. It was already late afternoon and for this particular reason we didn't want to hike a half an hour or even longer. So we ended up climbing next to the main road. We spent the following two days in Siurana. It wasn't that easy to find "the Craig" for everyone because of our different climbing skills. On the third day we took a time-out day. By the way the weather was perfect, not too cold and not too hot. During our time-out day, we drove to Tarragona to visit the sea and the lovely old town. After the previous climbing days in Siurana we decided to hike up to Montsant. Which is above the village of Cornudella. It is possible to hike from Cornudella to Montsant, but it's quite far. I recommend to drive by car until the street Emita da Sant Joen del Codolar ends. From there you can take the shortest way straight up from the church - about a 30 min walk, or go left and walk over "GR del Grau del Momasant". After we climbed some routes we changed the sector and the rock changed slightly. 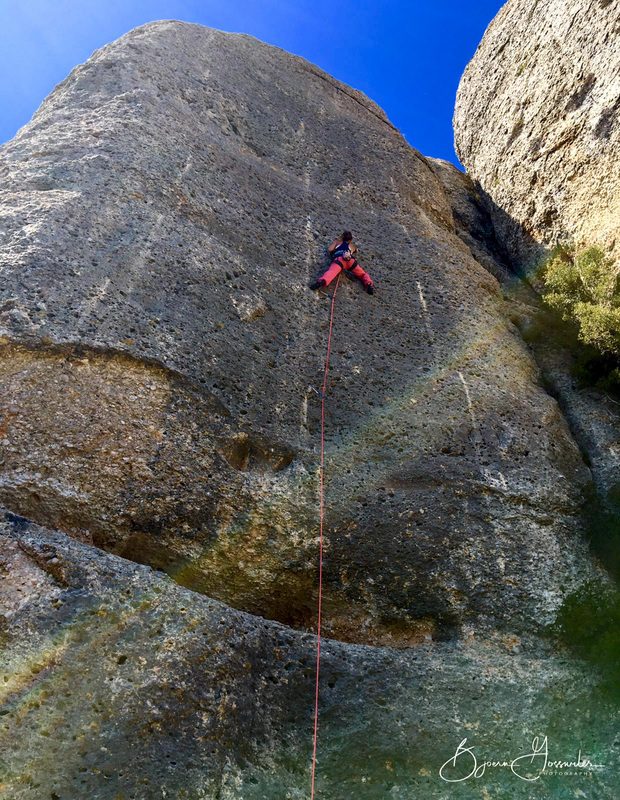 Desiree tried a long 6c route - I belayed her. After approx. 25m she was also tired as well. Alexandra and Josh were climbing next to us and they were busy for another half an hour. So I gave it another try to attack the rock again and surprisingly I could climb this 6c and I began to like the conglomerate. For the last two days we had to change our flat. The advantage of this was that we moved to Margalef. 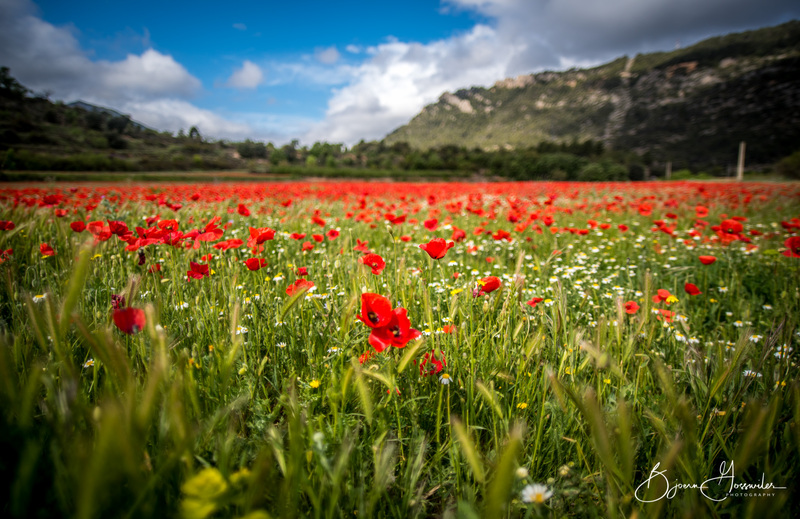 The journey to there was interesting, we passed some nice landscape and colourful poppy fields. 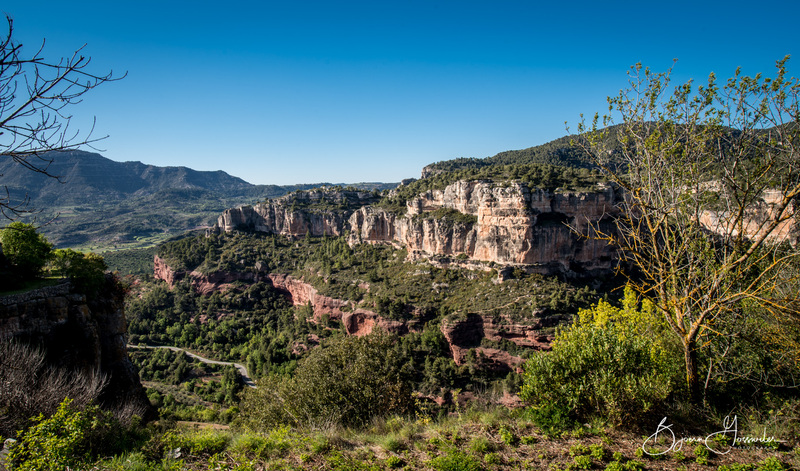 When we arrived in Margalef we had a look at the crags – My first impression was that they were quiet step! After a while we found a very nice crag with a wide variety of grades. We really enjoyed climbing there and had a great climbing adventure in Siurana-Margalef.